100% MADE IN THE USA! Sticks harvested, milled and packaged in Maine. Sold in 97 Wegmans Food Markets in the Northeast and in smaller stores and markets from Maine to California. Also at hotels, resorts, festivals and events throughout the USA and Canada. Typical retail prices are $2.95 to $3.95 per 6-pack. 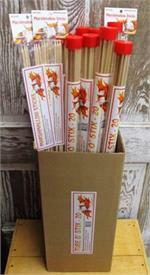 * We accept emailed purchase orders for 2 cases or more. No special paperwork or account set-up is required. Form W-9 from us upon request. ** This product has hang-tags. Contact us for pricing of optional POP display case. *** 4-packs also available. Contact us for pricing. 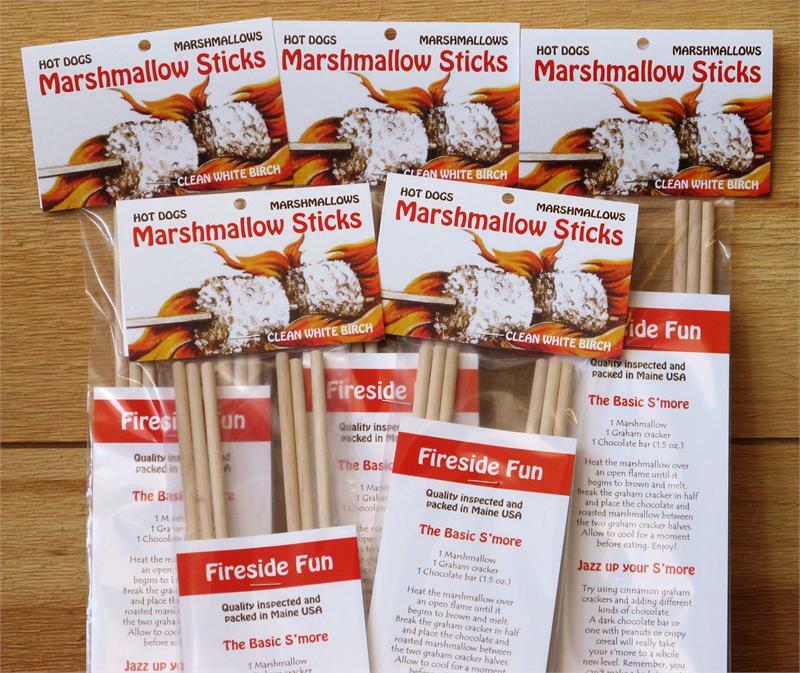 6 Northern White Birch marshmallow roasting sticks in a plastic sleeve with a handy hang-tag (with UPC code) and a colorful insert. 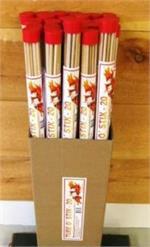 30" length keeps kids safely away from the fire. 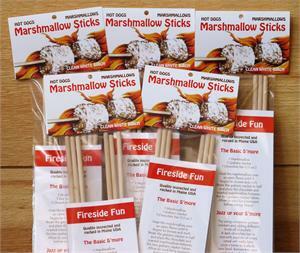 Child-friendly, semi-tapered ends that easily poke into marshmallows or hot dogs, but are not sharp and pointy. 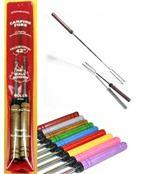 1/4" easy to grip diameter. CONTINENTAL USA SHIPPING OPTIONS: UPS Ground or UPS 2nd Day Air. Ground shipping takes about a week and is FREE if you order 6 or more cases. Please call us in advance to confirm availability of 2nd Day Air. SHIPPING TO HAWAII, ALASKA OR CANADA: Email or call to place your order and get the lowest possible shipping rate.